Casey has this thing – it’s called a pie chart band. Take all the things you like in music, and the ratio of which you like them. So if you like guitars quite a bit, you like short songs, you like female singers…whatever it is. And then find a band that matches that. A band that has all the things you like, and in roughly the right amounts. 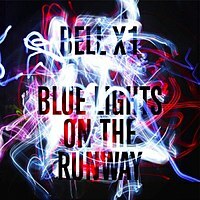 In 2009, my pie chart band was Bell X1, and the album Blue Lights On the Runway got me there. Bell X1, from Ireland, mine the same dark, clever pop as a band like Nada Surf. But they add a big dollop of electronica (later, I found out this was new to this record for them), an they are also gifted with Paul Noonan, who has an amazing gift for lyrics, and has a fantastic voice to boot. The opening track hooked me from the get-go. Ribs Of a Broken Umbrella crashes in with an anthemic keyboard riff, stops and starts, screams, buzzes and grooves it’s way out the door five minutes later. Later I would discover the song was about an old man the band met in New York. He had travelled to New York decades ago to marry his true love, but he never found her. He stayed in the city, looking for her ever since. This record sounds amazing (it’s produced by old Elvis Costello engineer Roger Bechirian). There is a lot of sonic detail – well placed guitar hook, the twiddle of keys, an electronic swirl… all serves to add colour to this record. But it fits in with the mood of the record – which is over information in our world of madness. In the Great Defector, Noonan sings in high speed about throwing up as a plane lands, marveling at all that’s going on around him. It’s a maddening blur. Taking aside the awesome rockers, there’s also some excellent intimate moments. Most of it comes lyrically; Scaling the north face of your neck, sings Noonan, on How Your Heart Is Wired. Whether it’s silly images like flicking knickers like a one stringed harp, or the straight faced affection of Light Catches Your Face, everything’s clicking. There’s also a healthy dose of self depreciation. They call themselves Blow Ins at one point. Elsewhere, Noonan wonders what it would be like to play in A Better Band. So yay! A new band, one with many old albums to explore. 2009 was such a great year for music. But it’s always so great to find one of those pie chart bands. That I’ll be with this band for a few albums, a few years. Ribs Of A Broken Umbrella by Bell X1. Everything great about this band comes together on this track. Pity the film clip is an edit version of the track. We are a blog after all. So lets make some lists. 10. Bob Evans – Goodnight, Bull Creek! We’ll leave the full babble for the end of the year. But Lily Allen‘s new, confident, mature, nasty, fun record has topped our list so far, with Stuart Murdoch’s new project God Help the Girl coming in a very close second. Jarvis Cocker starts all over as a British Nick Cave figure. So far a wonderful year for music and so much more to come. So many albums only just missed out. Here’s our top 10 songs not on our top 10 albums list.